Dinner in ten minutes for about $10? Prepared whole, USD$7 – $8 worth of flat iron steak can serve four with side dishes. Also known as “top blade” this is an inexpensive cut of meat from the shoulder region and is the result of a university study into undervalued cuts of beef. 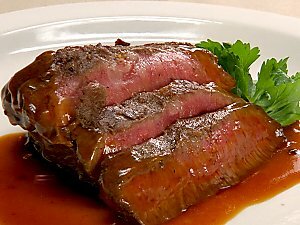 In terms of tenderness, it is second only to tenderloin and has much more flavor. The Flat Iron Steak….. easy to prepare and delicious…. 8 minutes over medium heat ash-covered coals. Or about the same on the middle section (indirect heat) of the gas grill. This is for a medium rare steak. Bleu d’Auvergne cheese for dessert. Slice half of the steak paper-thin and leave it raw. Dress with olive oil (or truffle oil), pepper, salt (and a sprinkling of red pepper flakes), dash of lemon juice and shaved parmesan cheese for a carpaccio. Grill the rest for the main course. Slice thinly across and drizzle with the sauce and sprinkle with fresh parsley for the most elegant presentation. This entry was posted in Entertaining and tagged Entertaining, recipes. Bookmark the permalink. Yummmmmmm! May I please be invited to dinner? I want to come too! Bleu d’Auvergne cheese for dessert sounds wonderful!!! Yum! As long as I can keep the lights low and you ignore that work in progress that is our humble… I would be honoured to have you at the groaning board. What time is dinner served? Promise I will not put my elbows on the table and I will provide lively conversation bring the Bordeaux. It’s always 7:30 for 8:00. Elbows welcome (those glasses get heavy.) Bordeaux more so. Lively conversation gets you invited back. I think we need to plan a trip girls. I’ll bring the whisky. Let me knock over a bank and I’ll book out the B&B with the Tiffany windows down the street. It is certain to be more fun than the progressive dinner that we host this weekend. Well, who knows? At least two of the guests are very interesting. Single Malt… see if you can find some Scarpa. There may be an unopened bottle under the bar…. Being raised a Southern Bourbon drinker, I’m a Knockando, Springbank guy for the most part. But, as I wrote, with single malts, they’re all great. Scarpa’s easy enough for me to find. And there is always my father-in-law’s collection. Roughly 300 bottles. Oh, and the back stock. This sounds very good. Not sure if you remember or not, but I emailed you about another one of your recipes awhile back, and I can’t wait to try to cut. Once I do, I’ll post back the results. Springbank Distillery is somewhat unique. It is the oldest independent family owned distillery in Scotland. I’ve have met the owner on many occasion, wonderful man. I personally love Lagavulin! Nicholas, welcome back. Please let me know how you make out. I hope you and your fiancé enjoy the recipe. AtB, you live a charmed existence. Please pass along my best to the owner of Springbank and thank him for his many good works. A dram of Springbank is a holiday treat (it runs around USD$65 a bottle here in Virginia!) Lagavulin — you are no shrinking daisy of a whisky drinker — Slaandjivaa! Wow USD$65! I will send your regards to Headley, he really is a wonderful and most generous man. Prior to leaving my former post I was the gala coordinator for one of Scotland’s national arts organizations and Springbank donates the miniatures for each guest every year. “Gala” has such a nice ring to it doesn’t it? I bet you were great at it.